The landscape of marketing has changed dramatically where the customer expects seamless interaction with businesses. There is a powerful convergence of marketing and technology. And advertising no longer builds experiences but delightful customer experiences do. Customers expect digital customer experiences (CX) by businesses not only integrated but also more advanced and secured. According to McKinsey Global Institute, data driven organizations are 23 times more likely to acquire customers, 6 times as likely to retain customers, and 19 times as likely to be profitable as a result. However, brands often fail to understand how to connect with multiple touchpoints, timeline, and people. The businesses need to focus to ensure that customer data is secured in a CRM, ERP or backup system so that all data is at one place, you can track customer interactions and also get a unified view. The experience customers have when they interact with your brand online over multiple touch points is known as digital customer experience (DCX). It is to deliver consistent service and satisfaction to the visitors as well as customers over different touch points giving unified support by understanding the journey at the right time. Learning about the customer journey and behaviors across all digital interactions and deliver unified support. Keeping all customer information in a centralized data place so that all the teams can get gain insights to handle customer across different stages of their journey. Proactively engaging the customers by sending right and on time message to make conversions meaningful. Both digital transformation & customer experience are the important components of the company culture and must be given top priority. 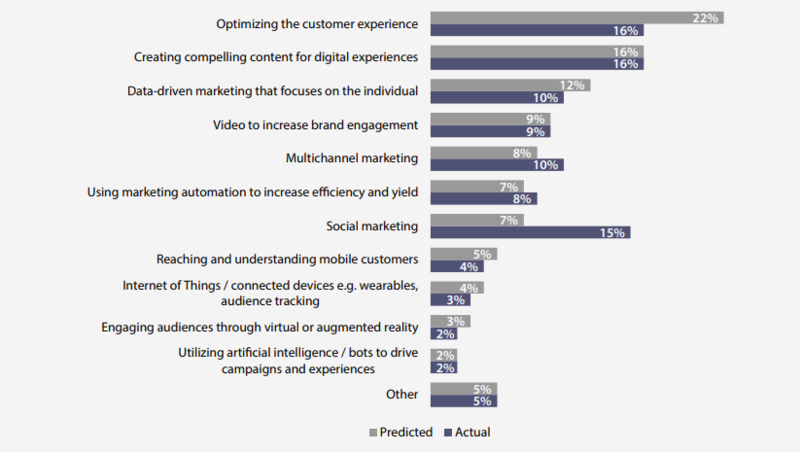 As per Adobe’s Digital Trends Report 2018, 22% of businesses put “optimizing customer experience” as their single most exciting opportunity, ahead of data-driven marketing for digital experiences. The below chart shows the optimizing customer experience is a priority thing. Loss of personal touch – When customers focus more on digitalization and almost everything becomes automated, businesses lose the pulse to understand customer’s problems in their journey. As a result, there is no personal touch in support offered to customers. Lack of consistent customer experience – Marketo State of Engagement Report states “82% of marketers accept that they know how their customers want to be engaged.” It also states that “few think brands are taking the time to learn and develop a relationship. Customers don’t turn on using a single channel while interacting with a business. They might first drop in an email, and then when unanswered, they might give a call or chat with someone on the website. Customer frustration level increases when they don’t find the same information across multiple channels. Staggering amount of data – Businesses in order to meet their objectives interact with customers across various channels and collect a huge amount of data in forms of conversations, transactions, online behavior, downloads, social media are in a huge pile and segregated. So consolidating and unifying them make sense out of data is really challenging. Fail to deliver a personalized experience in the customer journey – Segment’s State of Personalisation Report states that only 22% of shoppers are satisfied with the level of personalization they currently receive. Customers expect businesses to treat them as an individual person and to be dealt with like a human. They look for businesses who make them feel a part of themselves and deliver valuable services. Lack of personalized interactions leads to high churn rates, lower satisfaction levels, and low loyalty. Here are eight key points that will help you to humanize the digital customer experience. Being customer centric means planning your business strategies keeping customers in the frontline. It means offering a great experience through the buying journey and post purchase. Research by Deloitte found that customer-centric companies were 60% more profitable compared to companies that were not focused on the customer. Making your business process customer centric is the key to deliver outstanding customer experience. How to be a customer centric business? Understand your customer journey across all touchpoints and provide unified support. Follow a customer focused leadership for stakeholders to have same business outlook. Ask feedback from customers a regular basis and act on it in order to improve your business services. Use the right tools and metrics to measure business and team performance. The best example can be Amazon known as “Earth’s most customer centric company”. What Amazon did be the best customer centric company on earth? 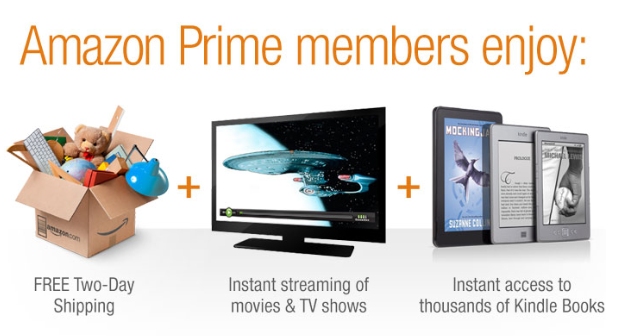 In recent years, Amazon has launched Amazon Prime, at the beginning a membership-only delivery service but eventually, transformed into a service enabling users to download music, stream movies, order food delivery etc. Some other newly-added Amazon services are Amazon Art, Amazon Video and Amazon Destinations. The company has revolutionized the ways of managing customers by focusing on customer first approach instead of a business first approach. Analyzing data to offer personalized service, offering real time assistance in their buying journey based on their previous browsing and buying history. Helping customers going out of the way to get the best deals. Mapping your customer journey helps to understand how your customers are interacting with you, what is their mode of communication and what is their average interaction time with your agents. When you do this exercise, you may come to know through certain touch points where your customers need human help in the form of a phone call, face to face interaction etc. Live engagement tools like co-browsing, voice and video chat can be used in real time to deliver interactive customer engagement platform. Phone call support for connects the customer and the agent directly and provides instant response. Face to face interaction by video chat helps to deliver virtual support for technical queries. Knowing where digital support fails and when your customers need human support helps to provide the relevant customer engagement platform enhance customer experience. How to understand your customer journey better? Create personas for each of your potential customers and map their customer journey. Thoroughly analyze customer data, their interactions and preferences to get a better understanding of gaps in customer experience. Leverage the data to identify engagement opportunities at every stage of the customer journey, be ir online or sometimes offline. The businesses personalizing their interactions at every step of the customer journey to create higher customer satisfaction levels and brand loyalty. Technology is advancing at a rapid rate and everywhere you turn today talk of automation replacing people. Consolidating Artificial Intelligence (AI) into your customer experience process allows you to have a deeper understanding of the individual customer but what it lacks is the flair in the activity, that human ability to cater to the needs of the individual. For example, Artificial intelligence can help customers in myriad ways but not all support services should be AI based. Many AI incorporated companies are shifting support reps from responding to rudimentary customer problems in order to assist customers in real time effectively. The support agents are always on the front line ready to offer critical support. Lack of understanding the customer queries results in a delayed and inaccurate response that affects customer retention. Unable to deliver real time solution and fails to meet customer satisfaction level. So, it is not mandatory that everything is to be automated. You can use Artificial Intelligence where it is needed without diluting the customer experience. AI will not be able to cannibalize human support. How to find the right balance between chat support and AI-based support? Identifying the support areas helps to balance AI-based support and human support. For the areas that are easily predicted, repetitive and can be easily automated needs AI based support. And for the complex areas that need comprehension and explanation areas human support is suggested. Choose the name of the insurance plan? What is the specific amount covered? What is the term of the plan? With AI based support this can be handled very smoothly and quickly but if it comes to some insurance-related query or verification query there a chatbot will fail. In such scenarios, human support can be the best way to assist the customer. A visually appealing and user friendly interface is essential in order to provide a delightful digital experience. The companies that invest in design outperform their competitors. Business Insider reports – over a 10-year span, the stock price of companies that placed a premium on design excellence outpaced the S&P Index by almost 220%. According to Forrester data, companies that prize creativity exceeds their design-negligent competitors in market share. Case in point: Airbnb. On a company audit of the brand’s website revealed unattractive, with boring photos and descriptions of properties. In a smart design move, the company stopped the users to upload the properties photos themselves. It arranged professional photographers out to take beautiful pictures for the site. Guess what! within a week, the new pictures doubled the company’s weekly revenue. A strategic focus on great design is the best form of digital competitiveness. Modern business can’t afford the risk to be out of touch with its customers. Great design requires an understanding of how your brand uniquely solves customer needs. Uber, for example, mobilize the power of experience design to give customers exactly what they are looking for: quick hail of a cab anytime, anywhere. Uber designed a complex logistics and routing infrastructure but it became successful by its simple designing and intuitive mobile app that empowers consumers. For the businesses that focus on being relevant must employ design to create useful, meaningful experiences and leave lasting impressions. So, it won’t be wrong to say no website will get impressions if there is no user experience and user interfaces in their websites. Consistent customer experience across different channels is very important. Your customer support team should be aware of the communication ways with your customers. It should be in such a way that you meet your customer’s queries on the preferred channel such as phone, Facebook messenger, text message, chatbot etc. For example, when the customer first approached over the phone, the assistance received was much more satisfactory than the second contact made via email. The inconsistency of information and lack of prompt support across multiple channels annoys customers. The customers today expect consistent humanized support across all touchpoints. Accelerate business growth by acquiring more customers to your business. With meaningful real time support deliver better customer experience and retain for a long time. Provide instant resolution of customer problems and build brand ambassadors. Identify your customer’s preferred channels and be available to assist at them there at the right time. Make your business goal to make the customer journey as hassle-free and provide many options across all channels to effectively engage customers to deliver a better omnichannel service experience. Customer feedbacks are the core of any business and are one of the main factors of growth. A humanized customer experience starts with understanding the emotions of your customers. You need to ask customer feedback regarding products, check in with your customers regularly. Once you gather detailed information from the feedback data, you can use them to create a better product or to improve customer service. The insights gained will also form the base of your future business plannings. You can ask the customer for feedback after each service or sales exchange. You can send specific surveys that ask them to rate and describe their experience. It is important to understand your customer’s feelings when they have decided to leave your brand, as it empowers your organization to take action and improve the customer experience. Customers connect with your business across multiple touchpoints and data is collected in different forms their entire journey. But collecting the data is not just enough but making the right use of it is what matters. Forbes study says 88% of marketers use data obtained to enhance their understanding of each customer. The customer data can be utilized to gain a deeper understanding of the customers based on their historical conversations, journey. The insights can be further used for making contextual conversations with customers to provide a humanized customer experience. For example – When the customer is confused and unable to proceed in the buying journey, you can use the insights gained from the data to complete it successfully. All the different forms of data need to be analyzed carefully to have a contextual conversation with customers. Meaningful conversations with customers with the right context help to answer the customer questions accurately and provides a better customer experience. Every brand has its own story. You need to make sure that you are communicating yours to customers in the right way. Customers prefer businesses that they can easily connect with. You need to ensure that your customers find you easily approachable when they need. For example, if your brand launches a new program or product, share this along with your customers by making them a part of it. Involve your customers in the product campaign, sending them invites to share their views and opinions over the social page. Your customers will feel valued and they will appreciate knowing that they are a part of your business. Including your team and customers further humanizes your brand. It conveys the message that your company works as a team and values its customers. Focus on the social engagement part of the business of your brand communication. Connect with your customers and involve customers in any new product launch or feature release. Keep your customers go hand in hand and be a part of your digital experience. With the new technological advancements such as artificial intelligence and machine learning, where businesses are being data-driven, the fact should not be ignored that human touch is very important. Nothing can replace human interaction for providing a comprehensive customer experience. Believe it or not, customer experience has become as important as the product itself. In the current time, customers don’t want to be served rather they want to be delighted by the overall experience. Creating a positive customer experience is imperative to survive and meet rising consumer expectations. An avid reader, eclectic writer, blogger and Content Writer by profession at REVE Systems, Snigdha Patel endeavors assiduously to understand complex support channels and provide information regarding them through comprehensive blog posts.